For many English learners, the hardest part of the journey to RealLife English fluency is taking that initial1 step away from their native language and committing themselves to not just learning English, but living it. You probably felt this way when you first started on the quest2 to improve your English, and even still face challenges reading, writing, listening, or speaking. A lot of times your own fears will prevent you from taking what seems to be a big risk. Your fears will come up with excuses and reasons to avoid English before even trying. You are afraid to make mistakes, to be excluded3 from the group, and that others will make fun of4 you. When you are taking that first step, you have no idea what to expect. Most of the time, it’s everything that you ever wanted and dreamed of. You just have to have that initial dose5 of courage to step outside of your comfort zone6 and into your greatness7. Once you commit yourself to living English, it is essential to understand your fears and find ways to step outside of your comfort zone on a daily basis. 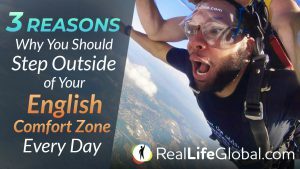 In this article, we will focus on the reasons WHY it is so important to step outside of your comfort zone everyday if you want to become the hero of your journey to RealLife English fluency. Two of the most admirable9 character traits you can develop in your life are courage10 and confidence11. With these two traits you can take on just about any challenge that comes your way. History’s greatest leaders, such as Martin Luther King Jr., Mahatma Gandhi, Rosa Parks, and Harriet Tubman, were known for their courage and confidence while under pressure. These leaders stood up for12 what they believed in, even if it meant standing out13 from the crowd and facing the fear of being rejected14 or excluded from society. They were respected by many because they used their voice to say what many were afraid to, and as result led large social movements across the world. The legacy15 of their work and impact can still be felt today. Even in many popular books and movies such as the Matrix, Harry Potter, and Lord of the Rings, the stories commonly take the protagonist16 on a journey where they are forced to step outside their comfort zone and along the way they face a number of challenges and their biggest fears. Through this process, the main character grows faster, stronger, and wiser17, and is able to take on tougher challenges as the story progresses. This same principle applies to you. By stepping outside of your English comfort zone everyday, you can become the hero of your English learning journey. Each day it is crucial18 to do things that make you feel uncomfortable with your English such reading a book, writing a story, listening to podcasts intended for native English speakers, attending language exchanges, or talking with a friend on WhatsApp or Skype in English. You know yourself the best. There are certain areas of your English that you know you want to improve, but are avoiding. Understand that it’s normal to feel uncomfortable especially when you are living your English, but you have to face your fears if you want to grow. When you step outside of your English comfort zone, you are making the decision to face your fears and build courage by doing things that make you feel uncomfortable. Don’t run from your fears. Choose courage, take them on19, and build the confidence to repeat the process. As you learn to step outside of your English comfort zone and face your fears, your confidence in your own abilities will grow. Your comfort zone will get bigger and bigger as you become more comfortable doing the things that once terrified20 you. It’s all about gaining momentum21. After you overcome one fear, it becomes easier to overcome the next one. Each time you face your fears, you will build more and more courage and confidence to tackle bigger challenges. As a result, you will become comfortable doing things in English that you didn’t think would be possible when you first started off on this journey, such as giving a presentation in English, traveling to an English speaking country, or meeting native English speakers in your own country. When you expand your English comfort zone, all of your interactions in the language seem to flow more naturally. Instead of worrying about your grammar or pronunciation while you are speaking, you don’t even have to think about it anymore. Letting go22 of the fears that were holding you back23, gives you permission to live your English to the fullest and become the best version of yourself. If you never take risks and stay within your everyday comfort zone, you will likely make less mistakes, but without advancing your vocabulary, pronunciation, and grammar skills. Unlike what we are taught in school, mistakes are a good thing. In many situations, they can be our best teacher because they give us feedback24 on what we are doing wrong and show us ways to improve. Behind each mistake that you make while trying to speak English is a lesson to be learned. We commonly, perceive mistakes as bad things to avoid, but with the right mindset25, you quickly realize that they are opportunities for growth. You may believe the worst case scenario when you try to use a new word or phrase in English is that you will mess up26 and people will make fun of you. Even worse would be to not try at all. If you never try to speak English, you will never achieve any goals that you have set for yourself. Most of the time people will understand your struggle and try to help you with your mistakes. But if that’s not the case, you need to find people who support your growth process. Throughout the journey to RealLife English fluency, it helps to surround yourself with a tribe of like-minded English learners and mentors that will support your growth and give you feedback on the mistakes that you make. Your tribe should give you a safe space to share your ideas and make mistakes without encountering27 too much judgement28. Are you looking for a supportive community of global English learners to practice English and connect with? Learn more about our Native Immersion Course that will give you a lifetime, unlimited access to our RealLife Fluency Circle Group where you will be able to share your ideas and live your English with people from all over the world. Now that you are motivated to face your fears, it is time to take action. Locked within you is a universe of potential power. Instead of running away from your English fears, today make the decision to break free29 from your comfort zone, and do one thing that makes you feel uncomfortable. You won’t regret30 it. The greatest growth comes when you leave your comfort zone, and unlock your true potential. Today’s the day to take the leap and commit to living your English! Hi. It’s exciting to know that someone who lives abroad is interested in learning Catalan. It makes me happy. Would it be correct to ask the real reason for choosing this language? I’m pleasantly surprised.